20/01/10 - Israel’s economy has shown resilience during the global recession, but more active education and employment policies – particularly targeted at minority groups – are needed to bolster its economic performance and bridge deep divisions within its society, according to the OECD. These are key conclusions of two newly published reports, an OECD Review of Israel’s Labour Market and Social Policies and an OECD Economic Survey of Israel. Both identify employment and social inclusion issues as vital to Israel’s future economic development. They were drawn up and published in the context of ongoing negotiations for Israel to become a member of the OECD. 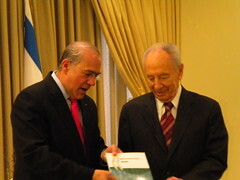 Launching the reports in Jerusalem, OECD Secretary-General Angel Gurría noted that Israel’s economy has successfully weathered the crisis. GDP growth in 2009 is now estimated to have been around 0.5% – above the projections made by many, including the OECD. “In light of this and the faster recovery apparently underway in many trading partners, our next projections to be released in May will almost certainly be revised up, with growth somewhere between 3% and 3.5% for 2010 and probably over 4% for 2011”, Mr. Gurría said (read the speech in full). But there are weaknesses in the Israeli economy, particularly on the social welfare side, he noted. One in five Israelis lives in poverty, a higher ratio than in any OECD country, according to the OECD Review of Israel’s Labour Market and Social Policies. Poverty is highest among the youngest and fastest growing population groups: just over half of Arab Israelis and 60% of Haredim, or ultra-Orthodox Jews, have disposable income that is less than half the national median – the standard OECD measure of poverty – compared with just over 10% of the rest of the population. This reflects low employment levels, particularly among Arab women and Haredi men, and low basic support for pensioners. Overall, about 40% of Israelis aged between 15 and 64 are not working, compared to an OECD average of 33%. Most low-paid jobs with little security are filled by Arabs, Haredim and foreign workers. At the equivalent of 16% of gross domestic product, public spending on social policies in Israel is low by comparison with the average for OECD countries of 21%, and getting more people from under-represented groups into employment will require increased public spending. But it will be money well spent, Mr. Gurria made clear. “Real progress on social issues requires a more inclusive society and better chances for all citizens to share the fruits of economic growth”, he said. To achieve these objectives, the OECD recommends investing more in active labour market policies and in making it worthwhile for low-skilled workers to take jobs rather than stay on the dole. It calls for action to promote fair employment opportunities for minorities in both the public and private sectors and to enforce labour laws and minimum employment conditions more effectively. It also recommends action taken to stamp out illegal hiring and employment practices for temporary foreign workers. On the education front, the OECD urges action to reduce the inequalities faced by Arab Israelis. It also calls for efforts to encourage the Haredim to strengthen their vocational skills as part of a drive for a more self-sufficient – and less poverty-ridden – balance between religious worship and work. More generally, the OECD recommends efforts to improve the performance of Israeli secondary-school students in mathematics, reading and science. These could include extending to the upper-secondary sector measures such as extra classes for small groups of pupils that are already in force in primary and lower-secondary schools, it suggests. In tertiary education, it recommends revival of efforts to combine greater resources for universities and colleges with commitments for reform, in particular increased and differentiated student tuition fees and academic pay. While broadly praising the Israeli authorities’ response to the global downturn, the OECD Economic Survey also points to a range of other weaknesses in economic policy. In particular, it is critical of the continued intervention in foreign-currency markets by the Bank of Israel. The Ministry of Finance’s direct supervision of some financial markets is also regarded as undesirable. The Economic Survey also emphasises that while there are legitimate calls for increased spending – such as in social policy – the Israeli authorities should nevertheless reduce the burden of public debt on a sustainable basis. Squaring this with calls for increased spending will be tough: the report stresses the need to cut back on areas of public spending that are the least effective and it makes several recommendations on taxation. Caution in pursuing further corporate and personal income tax cuts is advised, along with the elimination of low-priority tax expenditures. Israel is one of five countries, along with Chile, Estonia, the Russian Federation and Slovenia, that were invited in May 2007 to open negotiations for membership of the OECD. Chile has successfully concluded the negotiations and recently signed an accession agreement to become the organisation’s 31st member. For further information, journalists are invited to contact Nick Bray by e-mail : nick.bray@oecd.org or telephone: +33 607478582.